Analytics and tagging aren’t the sexiest topics to entrepreneurs and marketers because they want to be working on things that have the highest impact on driving the needle. But not implementing the proper tagging and tracking solutions leads to an overall slowdown in your marketing operations. 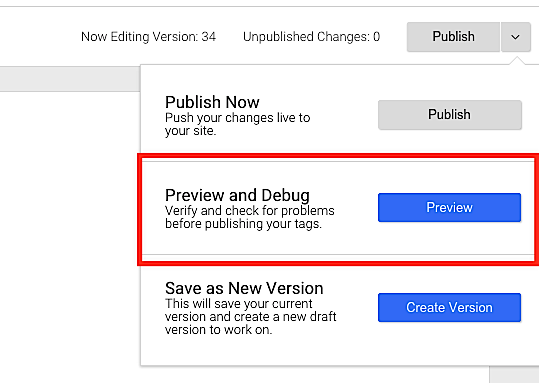 Not implementing a tool like Google Tag Manager is like letting debt snowball. In the technology world, people like to use the word technical debt. In this case, we can call it analytics debt. First, we need to define what Google Tag Manger is. 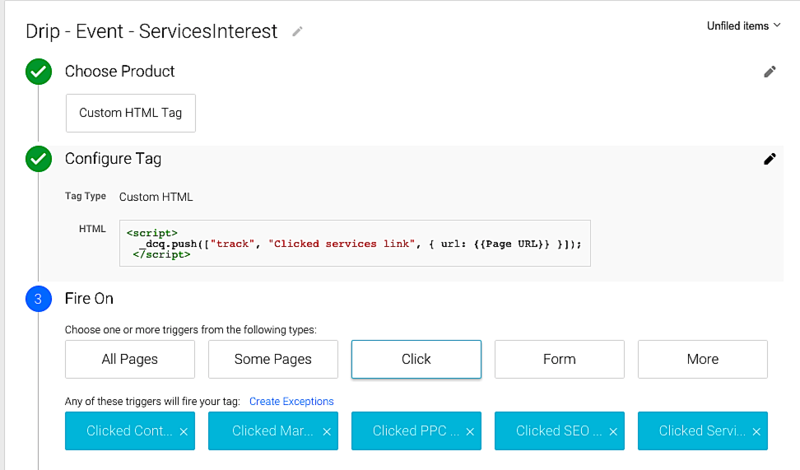 At a very high level, it helps marketers decrease the need to reach out to your engineers or IT team to add/remove/modify tracking codes on your website. Basically, you’re no longer at the mercy of your developers/IT team and they’ll be a lot happier knowing that everything is safe in one place. As marketers, speed is everything—this means testing new tools and vendors in days rather than weeks. 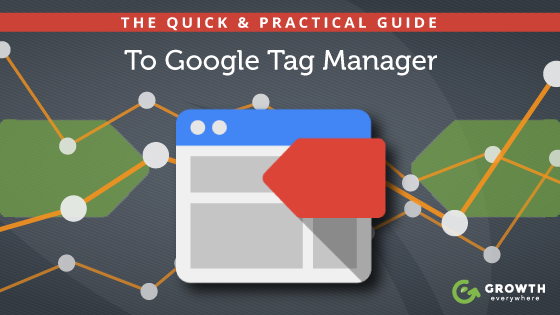 Since Google Tag Manager is one line of code, it means it’ll help decrease load times. Coding errors are minimized. Manual tagging causes more room for human error (and it’s tedious). GTM makes this all manageable. And if you have issues with the tags? Just deactivate them. Go to the GTM website and sign in. Once you have created an account, you’ll be presented with the account dashboard. After that, you’re free to start creating tags and triggers for your website. 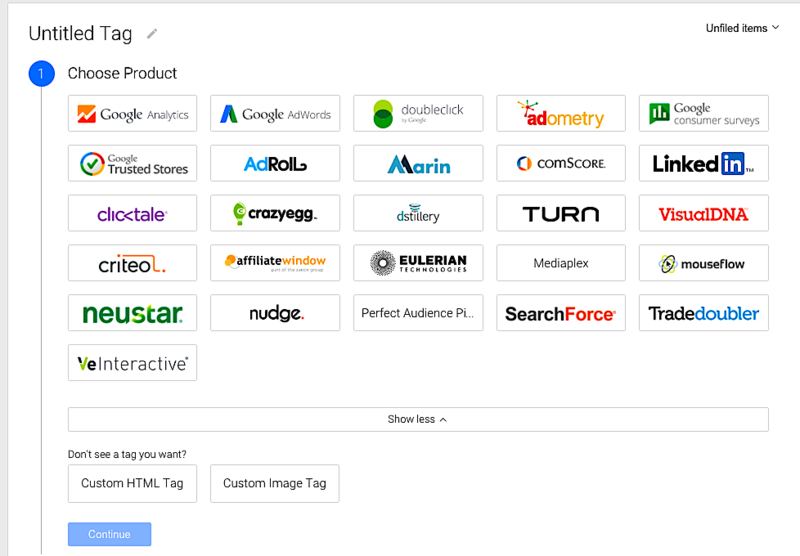 Google Tags make it easy to add conversion tracking, analytics, remarketing tags, and more. These are small snippets of code that can be Google Analytics/AdWords tags or non-Google tags (such as Facebook pixels). A few key points on what’s happening here. Drip = Our e-mail service provider. Event = An event we’re tracking in Google Analytics. Custom HTML Tag = This is a snippet of code we’ve taken from our e-mail service provider. Fire On = We’re only looking for people who click on specific links on our site. In this case, we’re only interested in the people who are clicking on marketing service page links. Then click the red ‘New’ button. 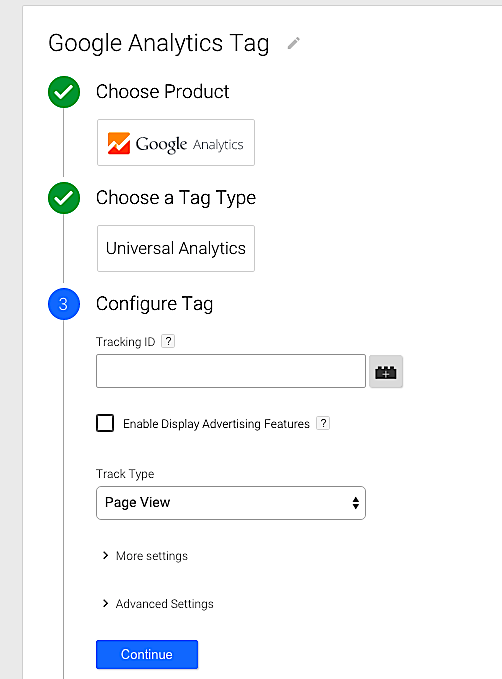 For ‘Tracking ID’, you’d put in your Google Analytics Tracking ID. Where it says ‘Fire On’, select ‘All Pages’. Viola! You’ve just set up your first tag! This is a very simple implementation of a tag. You can certainly add complexities down the line for whatever you are trying to do. For Triggers, there’s the option of selecting different events. In our case, we chose to look for people who are clicking on specific text (‘Content Marketing‘). On the left sidebar, click on ‘Triggers’. Enter in dummy text for now and save the Trigger. We’ll come back to it in a second. An event is an action. 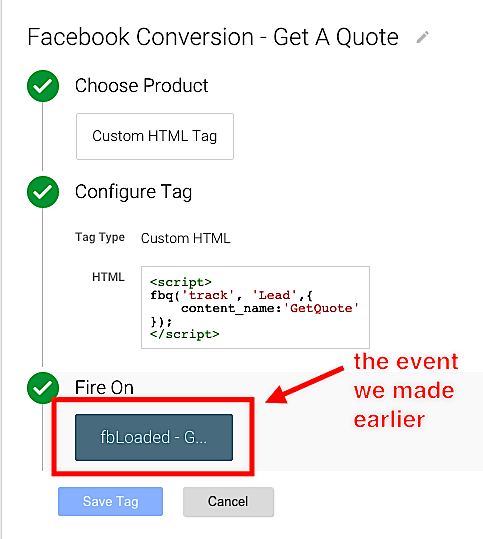 For example, if someone clicks on your phone number, you can tag that as an event and have it fire in Google Analytics. By doing this, you’ll be able to consistently measure actions that you deem important. Go to ‘Triggers’ on the left side. Click on the red ‘new’ button. 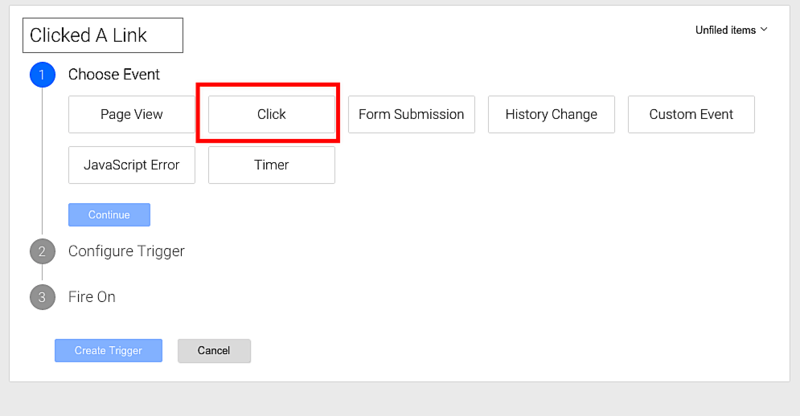 As you continue to add to GTM, you’ll be adding repetitive tasks. What if you had the ability to create shortcuts for these tasks? That’s what macros are. What Are Some Practical Use Cases for GTM? For more in-depth training on setting up Google Tag Manager, I highly recommend watching videos from GTM Training on YouTube. 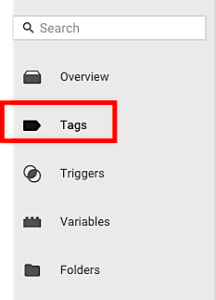 Google has a browser extension called Google Tag Assistant that allows users to see specific tags that are on each page. This helps with testing/implementation. 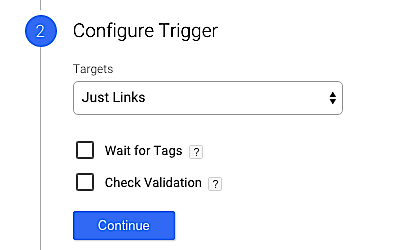 At the end of the day, Google Tag Manager is not only helpful for organizing all your tags; it opens up the possibilities for doing more with your web applications and speeds up your site by consolidating all the snippets that you had lying around before. Give it a shot and let us know in the comments below what you think!